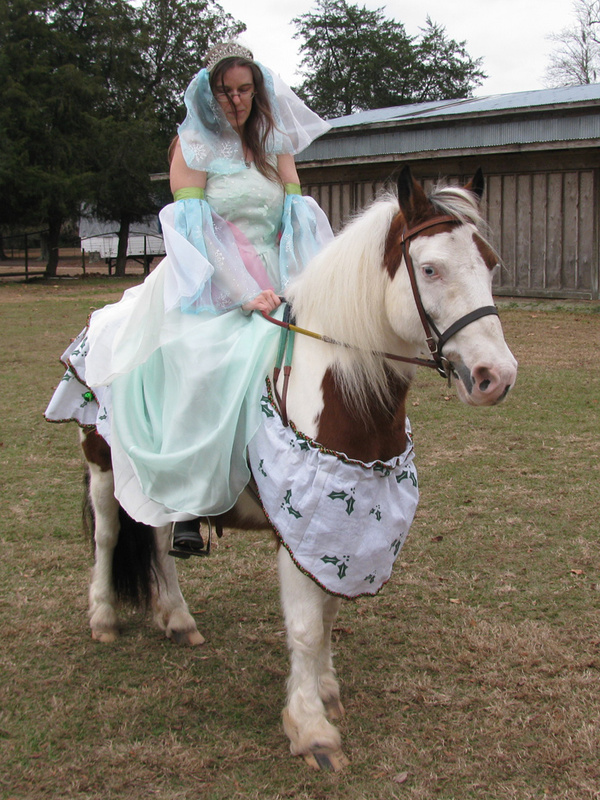 Entry for the Southern Legacy Stables winter 2014 costume contest. Not gonna lie – while this is at least partially yet another “cheater costume”, with the primary components being purchased and repurposed, I fell in love with this gown at Goodwill, didn’t get it, spent the afternoon fretting because I hadn’t gotten it, came up with a brilliant costume idea so I’d have an excuse to get it, and was on their doorstep the next morning at the crack of opening to frantically search through the rack in hopes of it still being there. I’ve always dreamed of seeing the northern lights in person – one of my favourite fairytales is “East of the Sun, West of the Moon”, and while the aurora itself isn’t part of the story, there are polar bears, a castle beyond the end of the world, and a girl who rises the north wind to the place her true love lies. I’m enamoured with the legends that say if you whistle or sing to the northern lights, they’ll come down and sweep you away. The dress, along with a fabric I’d spotted at Wal-Mart, seemed perfect for embodying them. It’s a pale green gown with several filmy, fluttery skirt layers, spaghetti straps, and a bit of floral embroidery on the bodice. It’s actually too big, so I had to take in the sides a bit – just hand-sewing; I couldn’t be bothered with anything else, and it’ll be easier to take out if I ever need to do that. The “sleeves” are pieces of translucent fabric stitched to green satin blanket binding, and close with velcro. The blue fabric has glittery snowflakes; the pink and white are plain. 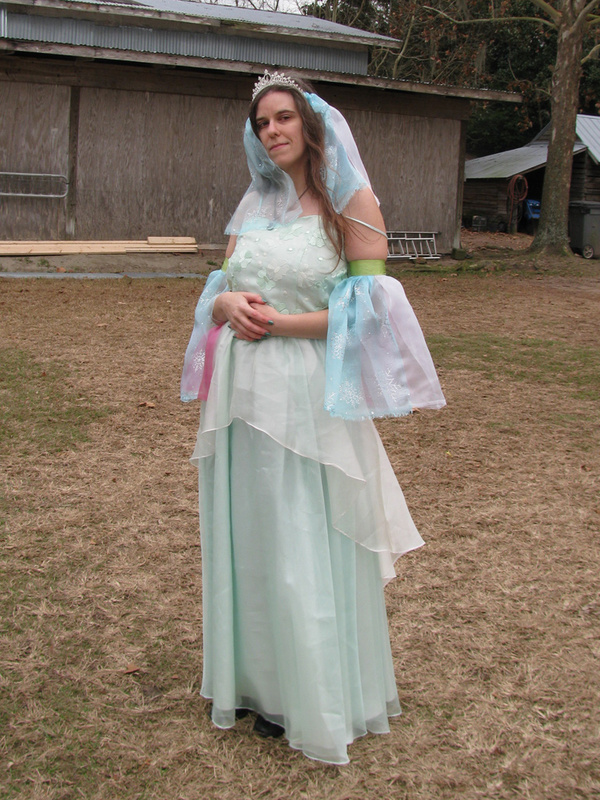 The same fabrics are looped over a length of elastic knotted to the tiara, which is out of my personal collection. Because I’m a princess. And I have a tiara collection. For no reason other than it makes me happy. 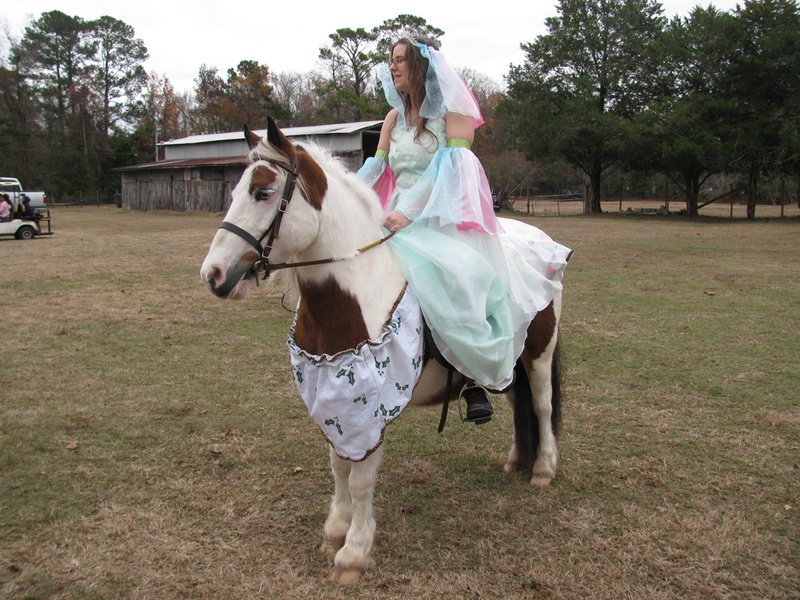 Tolkien is wearing the holly-leaf/garland ensemble first debuted with Jens in the Christmas Vixen costume. Don’t let the sidewall-eyes fool you – he’s actually been pretty chill about everything so far! Posted Monday, December 8th, 2014 at 12:20 am	in Fantasy.